Chef Judy Joo will make your mouth water with her flavorful dishes. Sure, you could pick up a bird at the grocery store, roast it (Meghan Markle-style, of course) and be on your way — no harm, but plenty of fowl. Or you could go one step further and give your chicken a flavor-packed Korean twist. Chef and restaurateur Judy Joo is here for our make-ahead Monday series, to cook up her deliciously crispy, juicy Korean fried chicken, that then turns into burgers and kimchi fried rice. The great thing about the rice dish? You can add (or subtract) whatever veggies you want, based on your own taste buds. And best of all, the chicken tastes even better the next day. "Korean fried chicken is best double-fried … so even if you make it on Sunday, you can simply flash-fry to heat through and you are all set!" Joo told Megyn Kelly TODAY. There's also a reason the main chicken recipe calls for vodka, specifically. "Vodka keeps the crust crispy and crunchy. Vodka works well because it is flavorless. You can use other alcohols but be aware that something like gin will impart flavor to the batter," said Joo. As for not overcooking the chicken, which is an issue for a lot of home cooks, Joo advised, "Use thighs as they are naturally juicier and a bit more forgiving if you overcook. Also use a thermometer, so you can test your chicken and take it out on time." "Being American, I have always loved fried chicken. Korean fried chicken has been gaining wide popularity in its many forms. The difference is in the very thin, crisp skin." "One thigh should be enough for this burger." "My sister used to make this for me when we lived together in New York, and I loved it! 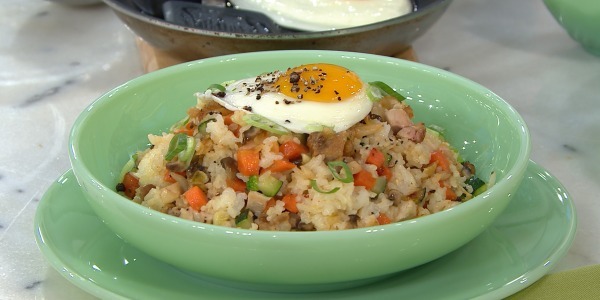 Fried rice is the perfect way to use up leftovers, so feel free to improvise. Any kind of veggies or meat you have in the fridge — just toss them in. This is a great lunch or side dish.